Penny Mason and James Wallace are independently practicing Waikato healthcare professionals. As Penny explains, they moved from the United Kingdom to New Zealand, via Australia, in 2006. “In New Zealand, opportunities for independent midwives are much better than in Australia and although we had no long-term plans, we decided to move towards Raglan, as we love the sea and the countryside around it,” she says. Since she started practising in New Zealand, Penny has delivered dozens of the Raglan community’s smallest, newest members. While she and James cherished the country lifestyle, her midwifery and the wish to drive less eventually persuaded them to move closer to town. “I practise independently. All my clients are in Raglan, which is full of a diverse range of people. I am lucky enough to care for women and families from all walks of life, which is a real joy,” she says. James, meanwhile, is a biodynamic craniosacral therapist, and consulting to patients from their relatively remote home was not that easy. 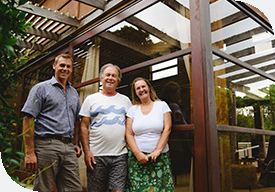 While living out in the country was idyllic, they looked forward to the practical benefits of being closer to Raglan’s thriving community. They contacted Richard Thomson of PGG Wrightson Real Estate, Hamilton, who sold their existing property to a couple with young children, and helped Penny and James find their new place, much more centrally located, though set on the edge of Raglan’s Wainui Reserve, still offering most of the lifestyle features they valued so highly. “Going through the purchase, Richard introduced us to the couple who were here previously. They were delightful. They were involved in designing and building the house, doing such a wonderful job. James and I have six adult children between us, living around the world. They were wowed when we showed them the pictures of this house. We are looking forward to having them to visit and enjoy it with us,” says Penny. She and James revel in their new proximity to the beach, as does their golden retriever, Fern. “We can now walk to the beach, which is a delight for us, and which Fern is really happy about too,” says James. For Richard Thomson, Penny and James were the midpoint in three linked transactions that he oversaw: as well as selling their previous property, he also helped the owners of the house Penny and James bought make their next move. On the hunt for a lifestyle property for two years to fit the pony and motorbike needs of their growing family, Richard found them a nine hectare waterfront block that they are now building on. “It has been a delight working with Richard. He was there in every way we needed him, and we feel a real connection with him. Although, obviously, it was a business deal, he managed to make it human as well. We found him a joy and a pleasure to work with,” says James.